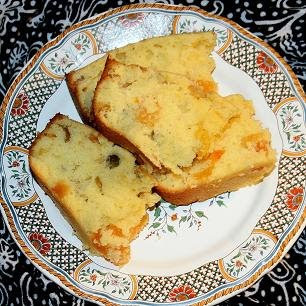 I found this recipe at www.recipegoldmine.com. The original recipe calls for dates, but I substituted dried apricots since I always keep apricots in the house. The bread is delicious and would make a lovely breakfast, or a nice dessert with ice cream on the side. Heat oven to 350F. Lightly grease and flour a 9 x 5-inch loaf pan. Mix the all-purpose flour, wheat flour, baking powder and salt together in one bowl. In another bowl, mix the milk, orange juice, zest and vanilla. Using an electric mixer, beat the butter and sugar in a large bowl until light and fluffy, about 2 to 3 minutes. Beat in the eggs. Gradually beat in the flour mixture and milk mixture using low speed or by hand, alternating in 3 parts. Stop when the batter has just come together. Fold in the dates (or apricots) and pistachios. Pour the batter into the pan and bake about 70 minutes, until a wooden pick inserted in the center comes out clean. Cool in pan on rack 10 minutes. Unmold and set loaf on rack to cool completely.